This week I am collaborating with Cayleigh from CNPrepster to bring you 7 of my fall must haves this season. Fall is my favorite season, and one of the reasons why it is such a favorite is the classic pieces that can be worn year after year. I have had some of the same pieces for many years, such as riding boots, vests, and sweaters. So, I wanted to share with you all some must haves that I seem to buy and wear each season. Enjoy! Riding boots are obviously an essential for fall, but booties have been increasingly popular in the last few years. They are versatile enough for the very beginning of fall but can also be worn all season long. Cognac leather is my favorite color for the season, which is why these booties made the list. Of course anything striped must make a list for fall essentials. I love this striped sweater because it can be layered with a button up and even a vest and still embody a classic look. I absolutely love field jackets. They are light enough to wear in the first few weeks of fall but also great for layering all fall and winter long. I love this one from Marley Lilly because you can add your monogram to it! I had this vest last year and I am obsessed with it. I love anything emerald green and the color is definitely in this season. Everyone loves quilted vests and adding this pop of color can keep vest season even more fun! I know sunglasses are associated with summer, but I have found that sunglasses are a must in the fall because the sun is still so bright. I love thick rimmed glasses in the fall, especially tortoise shell rims. I have had my eye on these for a while- they are so cute! Everyone needs a simple knit tee for fall, but I love this one because of the bow on the back. I am envisioning wearing it with a skirt, tights, and boots! I love A-line skirts, especially for fall. This one is the perfect color for the season and will go great with layers and tights! What are your fall essentials this season? Leave me a comment below because I am always looking for new fall items! 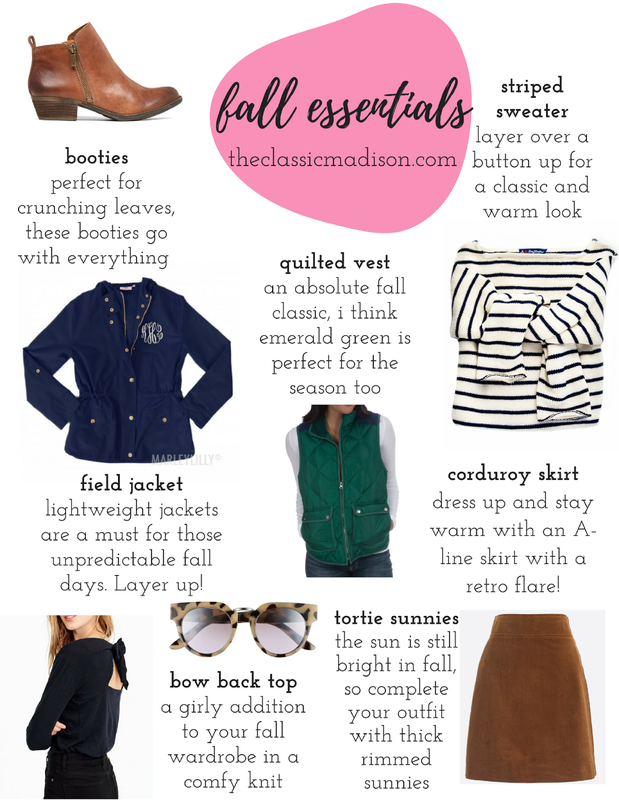 And be sure to check out Cayleigh's post here- we had a great time coming up with essentials for the season! Happy fall!